Aosman, founded in 2001, adhere to the spirit of innovation to create the world famous brand. 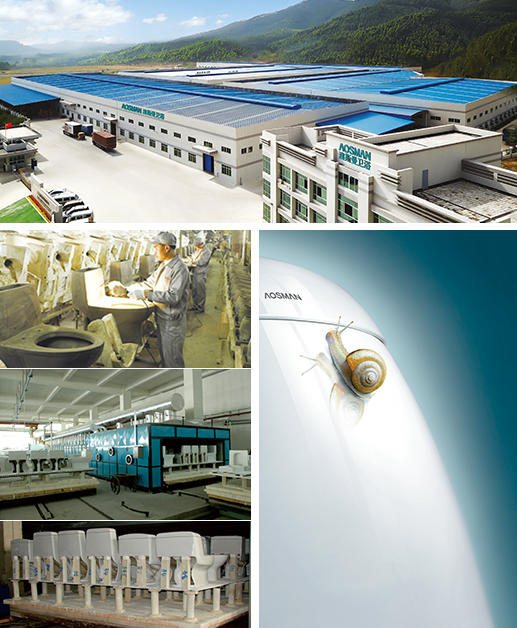 After more than 10 years of development, the Australian team has reached more than 2000 people, terminal outlets have been all over the country, and a number of world-renowned brands have established an important strategic partnership, for many years to maintain a sound momentum of development, has won the top ten Chinese sanitary brands ... and other honors, fruitful. There are two major production bases in Guangdong. Products cover Ceramic ware, leisure sanitary ware, bathroom furniture, hardware faucet, bathroom accessories and other sanitary ware field, is a ceramic sanitary ware production kiln, leisure sanitary ware, bathroom furniture production line, hardware product testing line and after-sale service system, such as system management system of national sanitary ware enterprises. The Aosmanroom adhering to the "quality, service, innovation"-oriented corporate philosophy, the establishment of the industry-leading research and development center, Innovation and Technology research and development as the guide, and constantly pursue the upgrading of technology and product quality, and the introduction of Australian automatic light structure wide body tunnel kiln, using the European and American advanced three-dimensional casting molding technology for production, with a strong equipment and high-end technology research and development, the Australian fast in the smart bathroom, intelligent toilet, smart home, smart cover Board, Constant temperature shower, water-saving toilet and other fields to establish a technology-leading brand image. pioneer in innovative bathroom technology, Australian DSM has been upholding the concept of technological innovation, has independently developed a revolutionary third generation of "seamless, double bright clean glaze," a molding all-in-one toilet, triggering the "evolution of bathroom", sensation of the entire industry, set off a new revolution in the toilet, the industry to build an updated beacon. 2010, the Australian continued the consistent water-saving research and development concept in product design, quality, technology and product packaging, such as the integration of Low-carbon environmental protection concept, after years of research and development personnel to accumulate technology, a comprehensive grasp of the revolutionary Eco-max water-saving Technology, and independent research and development of water consumption of only 3.2L "water-saving toilet", again sensation the entire industry, the perfect interpretation of "water-saving bathroom evolution. In 2017, after many years of technological innovation and accumulation, the Aosmanroom successfully break through the industry technical barriers, research and development of seamless full package toilet and the length of only 636mm of the super short toilet, and again refresh the industry's new technical standards, and then create a new paradigm of "bathroom evolution"! in the future, the Aosman will follow the trend of market consumption, user-centric, rapid response, committed to creating a personalized, stylish "custom bathroom" space, so that people enjoy the comfort of custom-made bathroom life, create a custom fashion high quality lifestyle! I still customized, I still o Portman!